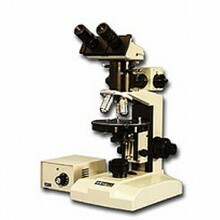 With Incident and transmitted light for advanced work, these microscopes feature a large sturdy base with either a monocular, binocular or trinocular head inclined at 30 degrees with a high transmission prism system. The binocular eyepieces are HWF 10X and focusing HWF10F with cross line reticule. Extra bright, extra large interference figures are produced by a quality Bertrand lens. Analyzer, in slide for east-west insertion. Bertrand lens with field limiting stop for E-W insertion. Polarizer, in swing-out click/clamp mount, fully rotatable. There is a centerable quadruple nosepiece with one fixed and three centerable objective apertures. The configured models comes with SM Plan strain free objectives 4x, 10x, 40xs. There is a rotatable stage, 150 mm in diameter with graduation at 360 degrees and a strain free Achromatic condenser N.A. 1.25 with aperture iris diaphragm and swing out filter holder. Low positioned coaxial controls are standard graduated to 2 microns per division. Built in transmitted Koehler illuminator with 6v 30 watts with variable rheostat control. Vertical Koehler illuminator with 6v 30 watts halogen lamp with variable control supplied in separate case. Microscope comes complete with Mica 1/4 wave plate, first order red plate and a variety of compensators. A wide variety of accessories are available. Click the button below to add the Meiji ML9400 Polarizing Microscope Series to your wish list.